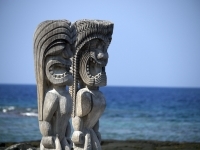 This important Hawaiian cultural and historical site on the black-lava Kona Coast of the Big Island contains some forbidding-looking giant idols, although it was in fact built as a refuge for ancient Hawaiians who had violated kapu (social taboo) or as a sanctuary for defeated warriors. The surrounding area outside the huge enclosing wall was home to several generations of powerful chiefs. The 182-acre park also boasts other archaeological sites including some temple platforms, royal fishponds and the ruins of ancient villages. The Hale o Keawe temple, which contains the mortal remains of 23 Hawaiian chiefs, and some thatched buildings have been reconstructed. Opening times: Park: 7am to sunset daily. Visitor centre: 8:30am-4:30pm daily. Admission: $5 per vehicle, or $3 per individual. Passes are valid for seven days.